Have you ever seen something on a menu and thought WOW, I bet that is amazing! Then when you order it the waitress says WOW, I LOVE that dish!! Both of those things happened to me at Rockford Wok/Bar/Grill in Langley where I was meeting Rochele the Intern and Dylan from the world famous MTAF music blog for lunch. The company was great, easily two of my favourite people in the whole world, and I brought along my daughter Hayley to provide the cute factor that I have lacked for some time. Then my food showed up. It’s not that it was terrible, it was just not what I expected. I ordered Eggs Benedict Poutine, probably the single most unhealthy sounding dish ever created. 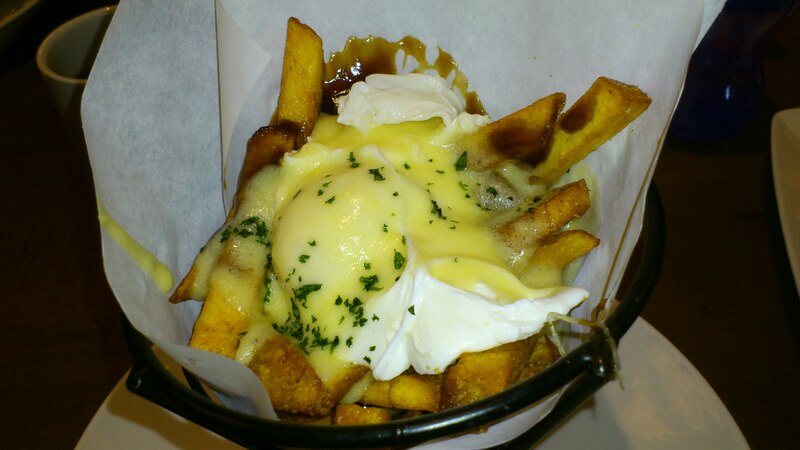 Poached egg, Hollandaise sauce, cheese curds, beef gravy and fries. All of those things are in my top 25 “things I eat way to much of” list but, damn, Hollandaise sauce and beef gravy, what was I thinking?!!? Every part of this dish was good, just not together. One day I’ll learn to read the ingredient list as a whole instead instead of just looking for key words and drool spots, one day. You’re one of my favourites too, buddy! Good times, indeed. Oh my god, that looks heavenly!! I think they have a Rockford on Broadway near Granville, definitely have to try this out!